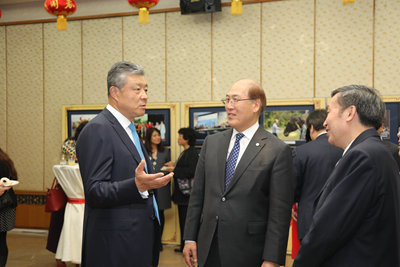 On the evening of 27 November, Ambassador Liu Xiaoming and He Jianzhong, Vice Minister of the Ministry of Transport of China, who led the delegation to attend the 30th Assembly of the International Maritime Organization (IMO), co-hosted a reception at the Embassy, marking the opening of the 30th IMO Assembly and the 28th anniversary of China being a Category A council member state. Nearly 350 guests attended, including Kitack Lim, IMO Secretary-General, ministers of foreign affairs, transport, shipping and fisheries from Antigua, Malta, Malaysia, Singapore, Bangladesh, Poland, Greece, Cyprus, Panama, Bahamas and Jamaica, ambassadors and high commissioners to the UK from more than 20 countries including Mexico, South Africa and Belgium, over 150 IMO permanent representatives from the London diplomatic corps, and officials of the Secretariats of the IMO, the International Mobile Satellite Organization (IMSO), and the International Oil Pollution Compensation Funds. 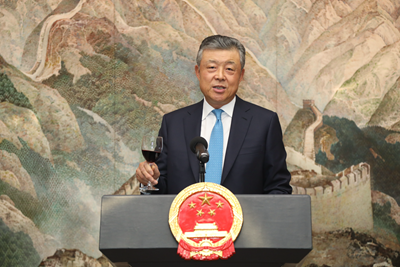 Ambassador Liu delivered a speech at the reception. He briefed the guests on the 19th National Congress of CPC, noting that Xi Jinping Thought on Socialism with Chinese Characteristics for a New Era has outlined the blueprint for China’s future development and highlighted China's commitment to making greater contribution to world peace and prosperity. 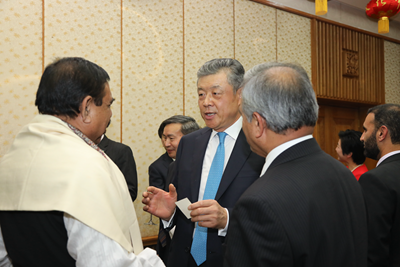 He pointed out that the Congress would have a significant and far-reaching impact on China's cooperation with the IMO, on the international shipping industry and on global maritime governance. Ambassador Liu said that as a Category A council member state for 28 consecutive years, China has worked actively for the IMO's effective operation worldwide. Since returning to the IMO family in 1973, China has been a powerhouse for the international shipping industry with its remarkable achievements. The Belt and Road Initiative, representing a major trend in economic globalization and trade liberalization, will create new opportunities for greater maritime connectivity and deeper international shipping cooperation. China will offer its wisdom to global maritime governance by pursuing ocean-driven economic prosperity and deepening mutually-beneficial cooperation with other countries, and protecting the marine environment. 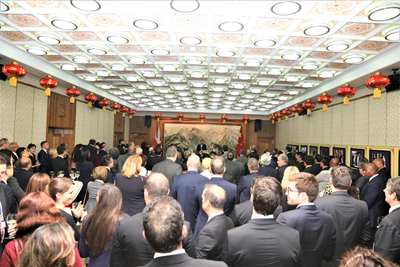 At the warm and friendly reception, Ambassador Liu and Vice Minister He held friendly talks with the guests about the future cooperation and development. 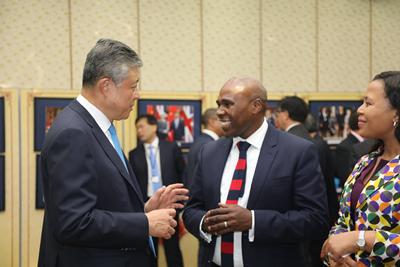 The guests commended China's global maritime governance of extensive consultation, joint contribution and shared interest. They all agreed that China, as a IMO Category A council member state, has made tremendous contributions to implementing the principle of safety, environmental protection, efficiency and sustainable development, enhancing international shipping cooperation and promoting sound and balanced growth of international shipping, and has built a brighter future for international maritime cooperation. Established in 1959 and headquartered in London, UK, the IMO is a specialized agency of the United Nations with responsibility for the safety and security of international shipping and the prevention of marine pollution by ships. It currently has 172 Member States and three Associate Members, and its technical standards are universally adopted by the international shipping industry. China, with the resumption of membership in 1973, was elected a Category B council member state at the 9th Assembly in 1975 and has been a Category A council member state since the 16th Assembly in 1989. The Assembly is the highest governing body of IMO, and the member States meet once every two years. This year's Assembly, held in London at IMO Headquarters from November 27 to December 6, focuses on electing the new Council, approving the budget and work programme for 2018-2019, examining the reports of the Council and various committees within IMO since the last Assembly, and studying issues, such as the strategies of improving ship safety, environmental protection, and transport facilitation.